Children’s Pool, also known as Casa Cove, is a pretty contentious place these days. The Children’s Pool is a simple pocket cove protected by a manmade seawall. It has a fine sand beach, calm waters and fairly good snorkeling. And harbor seals (Phoca vitulina) are often found on the beach, which has a lot of people up in arms. Seal lovers want the beach managed for the welfare of the seals. Divers and swimmers are unwilling to give up access to the beach, and some even go so far as to support physical alteration of the beach and seawall in such a way that the seals will have no choice but to depart. Children’s Pool is often in the news these days, and there are a number of websites created by interests on both sides of the issue. We’ll see how it all gets resolved, if ever. I have a lot of nice photos of harbor seals taken at the Children’s Pool, and often receive questions from people about them and the seals. Four years ago I posted my personal feelings about the harbor seals at Children’s Pool and my feelings really have not changed since then. 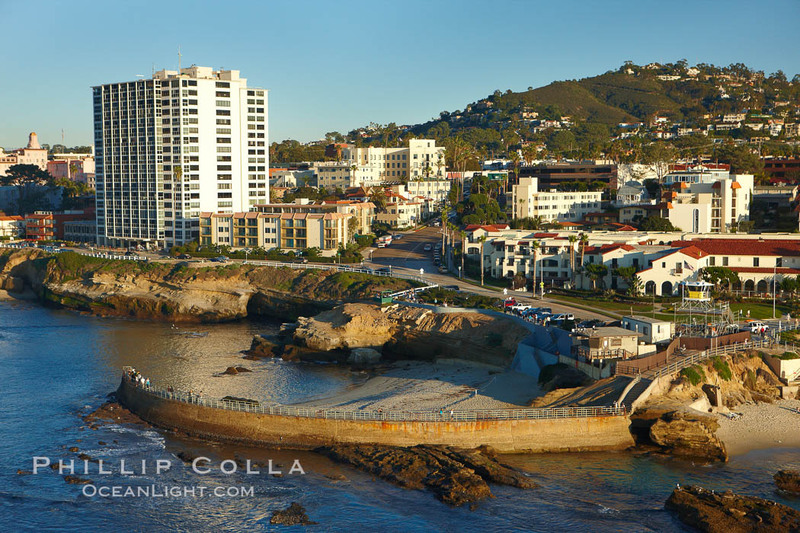 The Children’s Pool in La Jolla, also known as Casa Cove, is a small pocket cove protected by a curving seawall, with the rocky coastline and cottages and homes of La Jolla seen behind it.